here it is. 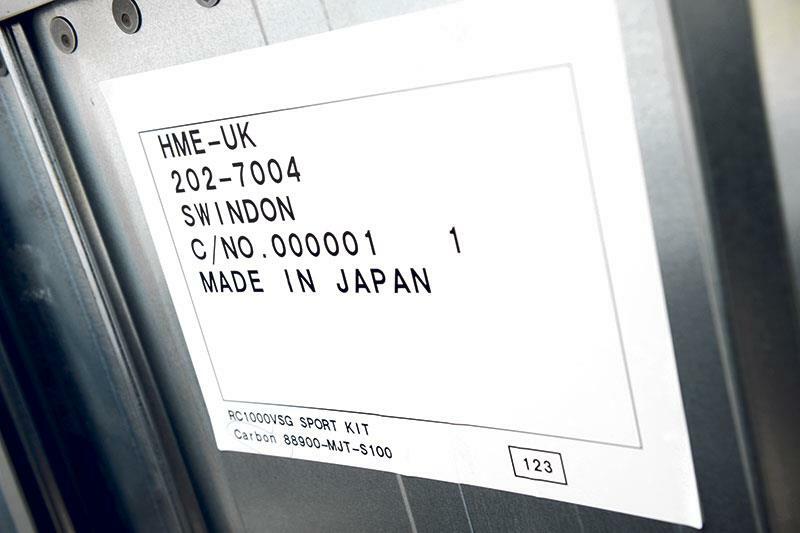 Inside a simple aluminium flight case, shrouded with a plain white plastic cover that details the contents beneath in basic, black type. No fanfare – nothing but that stark lettering to hint at the wildly exotic contents inside. 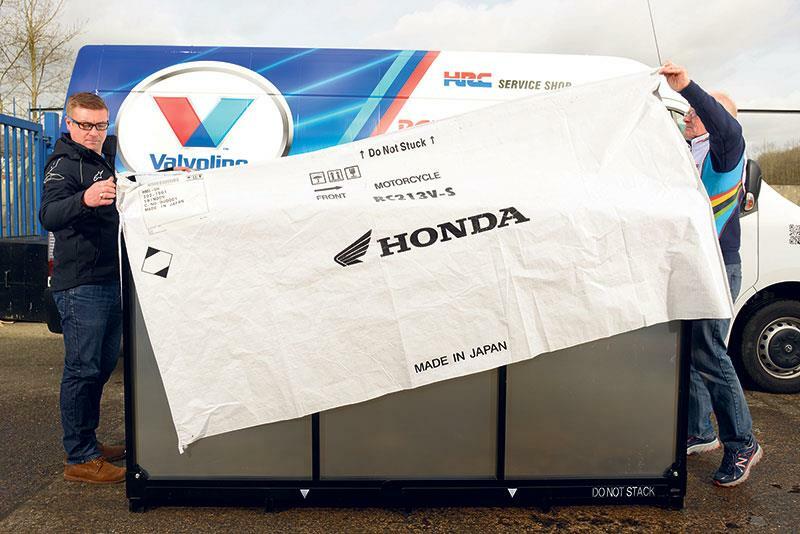 This is one of the first customer Honda RC213V-S’ to arrive in the UK. This may be a £140,000 MotoGP road bike replica, but there’s none of the hustle and glamour of a MotoGP paddock here. It’s a bitterly cold, grey and wet day in Batley, Yorkshire - the home of the world-famous Padgett’s Honda dealership, which has turned out some of the most successful Isle of Man TT race bikes in history. It’s also one of the only official HRC (Honda Racing Corporation) workshops in Europe. This crate, as with everything HRC produces, touches or tunes, exudes an aura of calm, methodical, clinical perfection – the lack of histrionics only increasing the intensity of the occasion. Being in its presence transports me back to the early 2000s when, as MCN’s World Superbike reporter, I witnessed HRC – time and again – uncrate stunning creations, such as the Castrol Honda SP-1 and SP-2. Watching the team mechanics unwrap carefully bagged, numbered and barcoded HRC parts showed the level of care and attention imposed on even the most mundane of parts. I once watched an immaculately turned-out technician apply a Honda top yoke badge in exact accordance with the measured paper positional template to a race bike that may well have cartwheeled through the gravel minutes later. But that’s the level of detail HRC work to, and all of that precision lives within the RC213V-S. The white, plastic material covering the crate underneath has a zip running up one edge to enable it to be lifted off effortlessly. With the help of Padgett’s boss Clive Padgett, I unzip the cover, and we lift it clear of the crate. Clive carefully folds it up for safekeeping. He then impressed upon me that absolutely none of the wrapping or contents from the crate must be chucked away, as the owner may want it all for the future. My mouth suddenly feels dry, so I just nod, skin prickling with the anticipation of what comes next. All that stands between us and seeing the bike – which I know from the label on the outside is an unpainted carbon-fibre version – are the dozen 10mm stainless steel bolts securing the sheet aluminium lid to the crate walls. With a 10mm socket fitted to a 12v electric drill, we get to work removing them. The mechanical action of drill on bolt starts to reverberate through the metal crate as the bolts succumb one by one, and we drop them into a parts tray for safe-keeping. The final bolt is removed, and I put the cordless drill down so Clive and I can lift the lid off the crate and peer inside. As the lid rises, a ghostly white form becomes visible within. The RC213V-S is wrapped in a simple white negligée, tantalisingly obscuring the carbon-fibre fairing panels. We carefully stack the lid out of harm’s way, and gently remove the dustsheet to reveal our first glimpse of the bike beneath. As the carbon tailpiece is revealed it reflects a grey British sky for the first time. It’s odd to think that this is the first light to hit it since being carefully wrapped up in Japan; the dust still clinging to the tyres having come from the HRC factory floor. We can’t see anything else yet, as the crate’s bracing struts – wrapped in bubble wrap – are hindering our access. The front strut has an attachment bolted onto the steering stem adding to the security of the bike in transit, while another rests across the rider’s seat to help keep the bike stable in its wheel chocks. Each bit is unbolted and removed, so the front section of the crate can be dropped out of the way and the bike inside revealed at last. With the dustsheet lifted away we step back, draw breath and just take a moment to stare silently at the amazing unpainted carbon fibre-wrapped bike beneath. It’s a real privilege to see it up close. Both wheels are held in place against wheel chocks, recycled packing material shielding the black-painted wheels from any potential harm caused by the restraining ratchet straps. My eyes are roaming across each of the bike’s components. Every element is something special, something race-derived and expensive, with performance being the only goal. The next stage is to charge and hook up the battery, check the fluids are topped up, and then add a splash of fuel before – hopefully – firing it up. After 10 more minutes of checking and fettling, the bike is freed from the crate and the side sheets of aluminium moved carefully aside. The base remains and the two wheels are both clamped into black-painted securing pieces. The rear clamp is bolted to the floor of the crate and with me holding the handlebars – rather nervously I have to admit – Clive unbolts the rear wheel and the bike is now free. “Would you like to wheel the bike out?” Clive asks. “No, no I wouldn’t,” I reply as the sickening sound of someone else’s £140,000 motorcycle toppling over onto concrete repeatedly plays in my mind. Clive takes over to get the bike off the crate, before handing it back to me to push into the Padgett’s workshop. 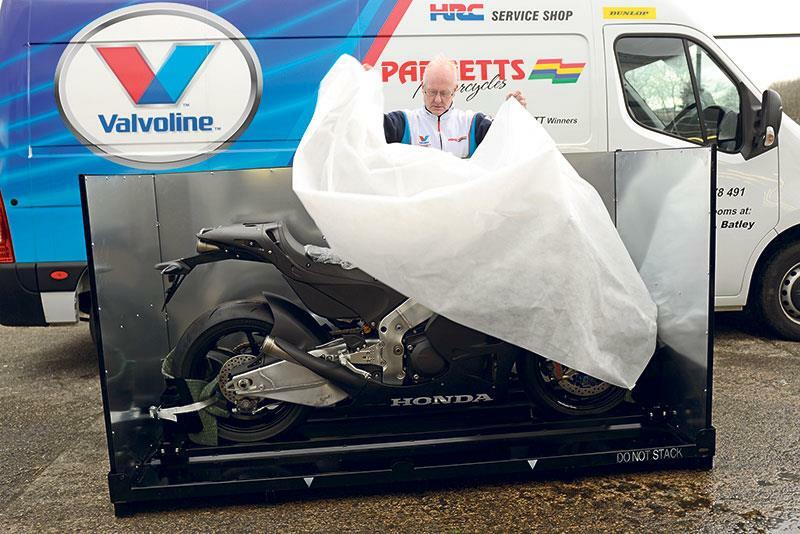 The bike had arrived in the UK via Honda Racing in Louth, whose experts had given it the first crucial once-over, yet the Padgett’s team still meticulously inspect the battery and fluids, just to reassure themselves that everything has been double-checked before making any attempt to start it. The expert technicians at Padgett’s get to work. During the day these guys work on normal road bikes, but as soon as the road racing season starts they are the ones who put together bikes like those that Ian Hutchinson won five Isle of Man TT races in one week with back in 2010. 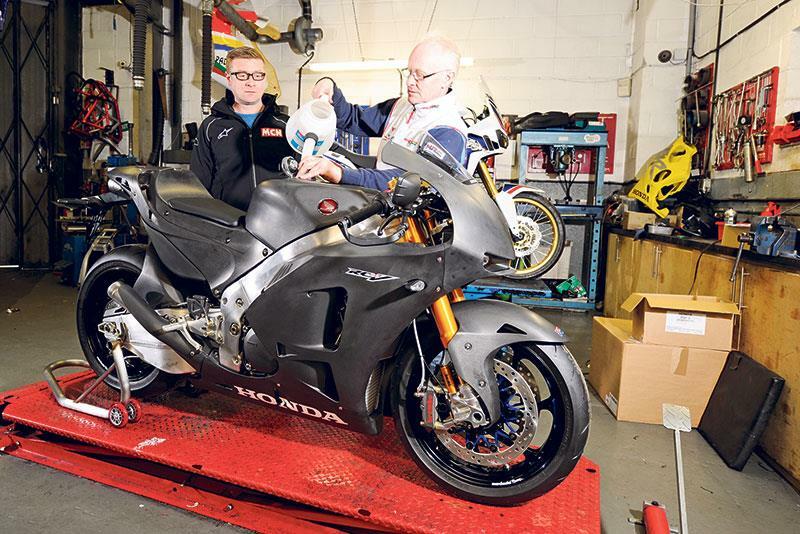 But even for them, working on the RC213V-S is something special. A close-up inspection of the bike reveals some interesting juxtapositions. Here is a road-legal version of the 999cc V4 bike Marc Marquez won the 2013 MotoGP world championship on. The engine cases use the same sandcast moulds as the racing bike – only the metal is different. The handmade swingarm is fabricated by the same HRC artisans who build all of the MotoGP bikes; the bodywork crafted from racing specification carbon fibre. And yet the steering lock owes much to the technology of a 1950s motorcycle because Honda hasn’t fitted the bike with a traditional ignition barrel. Instead there is a lock hidden away under the top yoke, between the front suspension struts, behind a metal cover. 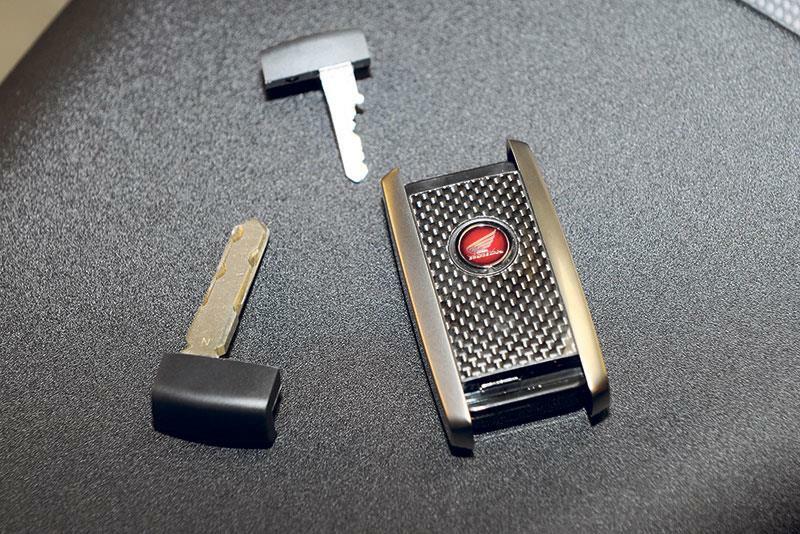 Even the key fob is unusual. It has a modern wireless main section that talks to the bike’s ECU and allows the bike to start as long as the fob is near enough. Inside one end is the fuel cap key and smuggled safely at the other end is a key for the steering lock. Honda clearly know these bikes aren’t going to be seeing daily action, as part of the wiring loom consists of a plug-in socket for a Honda-badged Optimate battery charger. This slides in on the left side of the engine above the crankshaft cover. The battery is now charged and connected and we’re ready to get the bike started. With no key to insert into a barrel it’s simply a case of flicking the kill switch to the ‘Run’ position, before thumbing the starter button. Almost instantly a growling, mechanical wave of noise erupts, washing over us and reverberating through the Padgett’s workshop. There is a loud ticking noise from the engine at idle too – the gear-driven cams adding an unusual and distinctive soundtrack of their own. Within seconds the smell of hot metal is wafting up from the bike as heat starts to build in the engine and exhaust system. The underseat exhaust is hot enough for me to slightly burn my fingertips on the protective wire gauze after less than a minute of the bike running. We switch off after 90 seconds or so for Clive and the mechanics to check the bike over again. All seems well. 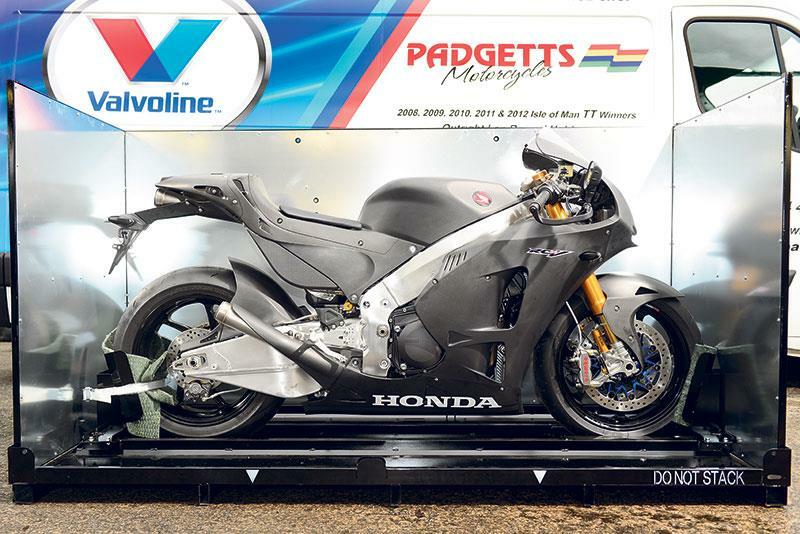 The next job for the Padgett’s technicians will be fully cleaning the exotic Honda before it heads off to its new owner. What an incredible bike to own. This one being destined for a long-time Padgett’s customer – having been bought as a birthday present to himself. As an RC213V-S owner, his name will grace one of the rarest group of logbooks in the world. Every buyer of an RC213V-S has the choice of spending even more money by taking up the option of the accessory ‘track kit’, which adds approximately £15,000 to the £140,000 price tag. The track kit boosts power from the fully road-legal 140bhp to a far more visceral 212bhp – and it’s far more than just a new ECU. The owner of this bike ticked that box, and it was fascinating to see what he’s getting for his money. The track kit arrived in its own branded flight case, which was mounted on polystyrene blocks inside another flight case. Once the outside case is unbolted and the two twisting locks are opened, the lid can be lifted and we got our first glimpse inside. 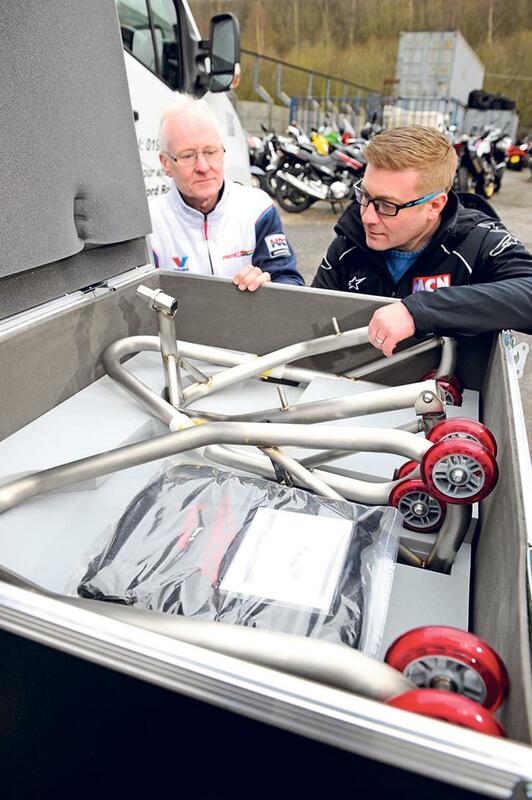 Inside the first layer of the crate are two paddock stands, both from ultra-thin walled hand-welded titanium, a gorgeous embroidered RC213V-S bike cover, and a DVD with the full workshop manual loaded onto it. It’s like metallic archaeology as we dig ever deeper into £15,000 of parts. 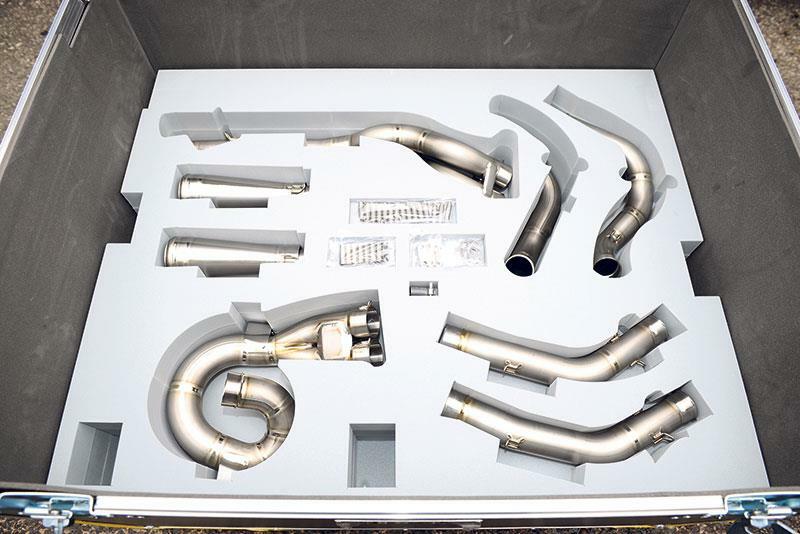 It’s impossible not to be excited by the next strata of loveliness, with each section of the track-only titanium exhaust nestling in its own laser-cut partitioned section of foam, the exhaust springs all bagged up separately. A third layer reveals the carbon-fibre ram-air scoop that replaces the front lights, there’s an HRC ECU, GPS data-logging unit, carbon-fibre dash mount and a bag of various small fixings. 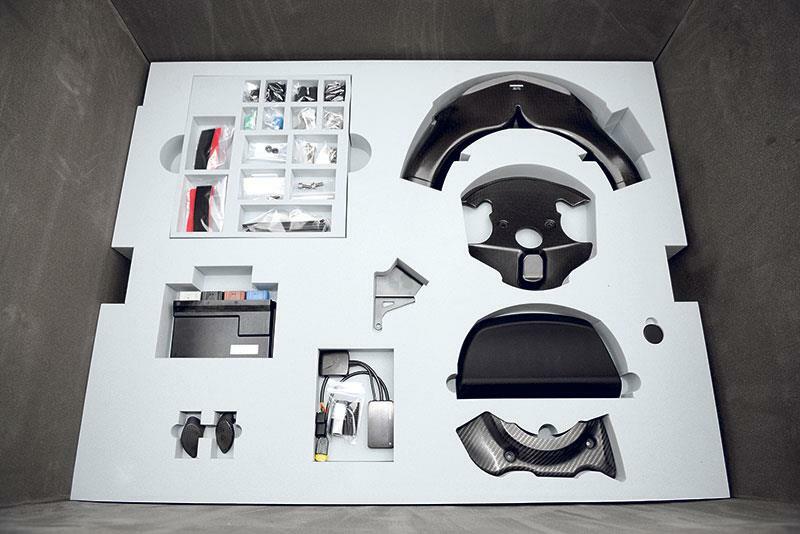 There is also an extra piece of seat foam, and two carbon-fibre blanking pieces to hide the holes left by the indicators when removed for track action. 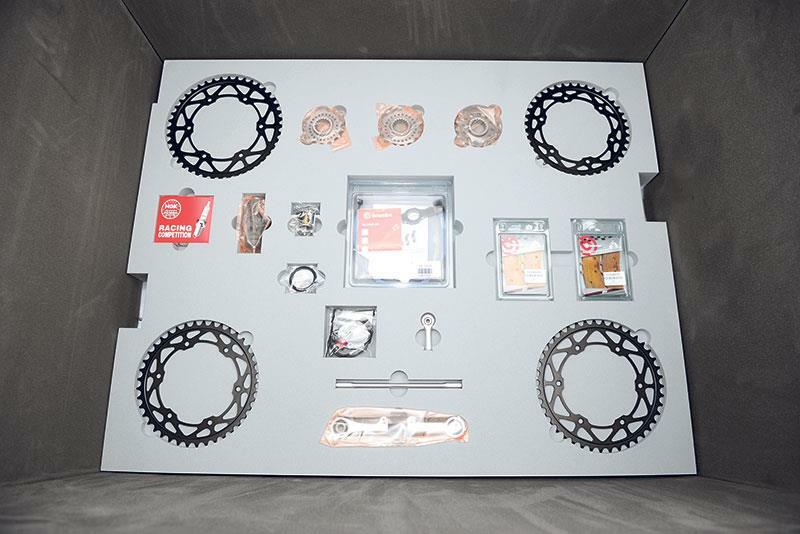 The fourth layer is even more mechanical, with four rear sprockets, three front sprockets, new spark plugs, a new gearbox selector drum with different track ratios, longer gear linkage, Brembo brake pads and a choice of different rear suspension linkages – all carefully stashed away in separate compartments in the grey foam. Just owning these parts would be a special experience in itself, owning the bike that goes with them is almost completely incomprehensible.